Austrian composer, born 25 October 1825 in St. Ulrich, Austria and died 3 June 1899 in Vienna, Austria. He composed dance music (over 500 waltzes, polkas, quadrilles, and other types of dance music), several operettas and a ballett. In his lifetime, he was known as "The Waltz King", and was largely responsible for the popularity of the waltz in Vienna during the 19th century. 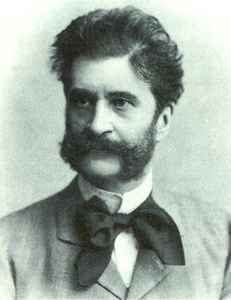 Do not confuse him with his father Johann Strauss Sr. who composed the Radetsky-March. He is the brother of Josef Strauß & Eduard Strauß.